Note: This is a guest article written by Michael Folling, the CEO at Limitless Designs. Any and all opinions expressed in the post are Michael’s. Have you always wanted to introduce A/B testing into your marketing skill set but are unsure of where to begin? Do you think A/B testing is for more technical marketers? If so, you might be worried about nothing. A/B testing, also known as split-testing, is a common feature of almost every marketing tool these days. Thankfully, many software products with built-in A/B testing functionality have made implementing A/B tests so easy that laypeople can learn to improve their marketing skills by using A/B tests. 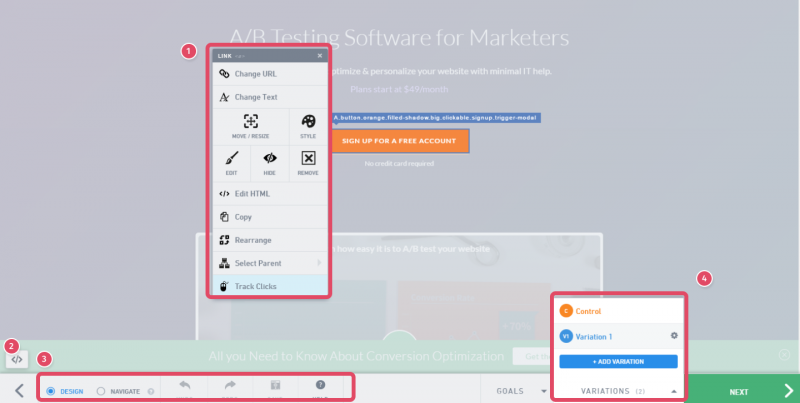 To help you get up and running with your first A/B test campaign, here are 6 tools with built-in A/B testing features that are easy to implement for the average nontechnical person. Let’s take a quick look at what A/B testing is. The reason why you would want to run an A/B test on your website is to improve conversions. For example, you can A/B test the product photos on your e-commerce website to see if models with beards increase conversions compared to models without beards. As you can see, with A/B testing, you can follow a process to slowly increase the number of website visitors that convert into customers. If done properly, you can be confident that you’ll always get the same results. So now that you understand what A/B testing is and the potential benefits of doing A/B tests in your marketing, let’s look at 6 tools that make it easy to run your first A/B test. Google AdWords may have been the first tool with built-in A/B testing, so it’s likely where most marketers launched their first A/B testing campaign. As Google gets paid each time someone clicks one of its ads, it’s in Google’s best interests to help improve the quality of its ads. And to help you figure out which ads are the best, you can A/B test your ads by rotating them evenly to see which has a higher click-through rate (CTR). 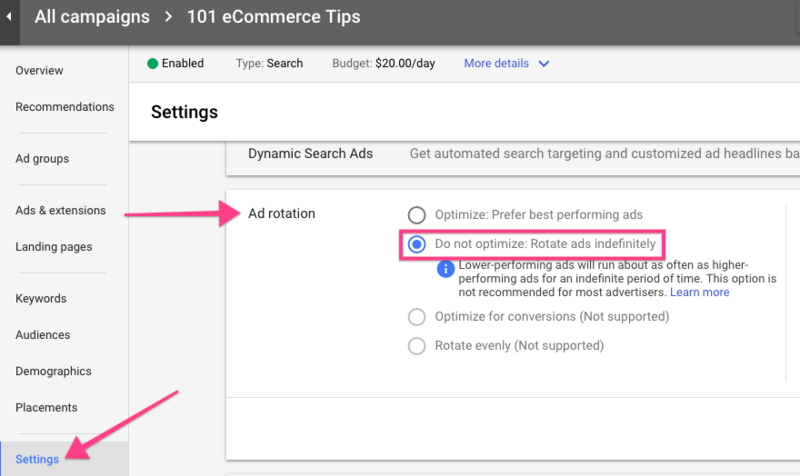 To get started on A/B testing in AdWords, go to your campaign settings, click to expand the Ad rotation settings, and then select Do not optimize: Rotate ads indefinitely. If you want Google to pick the winning ad, select the Optimize: Prefer best performing ads radio button. It’s a good idea to have Google rotate the ads indefinitely and then you can manually pick a winner. This would help you make observations about why some ads perform better than others. Next, make sure that you have at least 2 ads in each ad group, and then start collecting data. Unfortunately, AdWords won’t tell you if your data is statistically significant, so you’ll need to enter the impressions and clicks each ad received into a tool like VWO’s A/B split test significance calculator to figure out which ad won. If you’re not yet collecting email addresses on your website, you should be. Adding a pop-up to your website is a great way to grow your email list. One of the easiest ways to install a pop-up is with Sumo.com’s suite of free tools. Its “List Builder” tool makes it easy to strategically add pop-ups to your website to collect email addresses. But what if your pop-ups aren’t converting well? Fortunately, you can easily A/B test your pop-ups. To gradually increase the number of email addresses, you can create variations with different text, colors, or calls to action. Give your A/B test enough time to collect statistically significant data. After getting a clear winner, you can delete the losing pop-up and create a new pop-up to compete against the winner. Drip.com is marketing automation software that helps you send personalized emails at exactly the right time. For example, if you want to send an abandoned cart email 30 minutes after your website visitor added a product to the cart but didn’t complete the purchase, you can create an Abandoned Cart campaign within Drip to send the email automatically. But what happens if your recipient doesn’t open the email? That’s another missed opportunity. So, to recover such customers, you want to make sure your abandoned cart email stands out in their inbox and gets opened. Fortunately, you can increase the likelihood of that with Drip’s built-in split test feature. Within Drip, you have the ability to easily split test the subject line, “From” name, and/or delivery time of the emails in your campaign. Drip also tracks how many times the emails associated with each subject line were opened. After gathering a statistically significant amount of data, you can see in your dashboard the confidence level at which you would get the same results if you let the A/B test running. After you’ve reached a 95% confidence level or higher, you can stop the losing variation and continue with the winning variation, or create a new A/B test to try and beat the winner. Next, we’ll look at the ways you can A/B test chat messages. 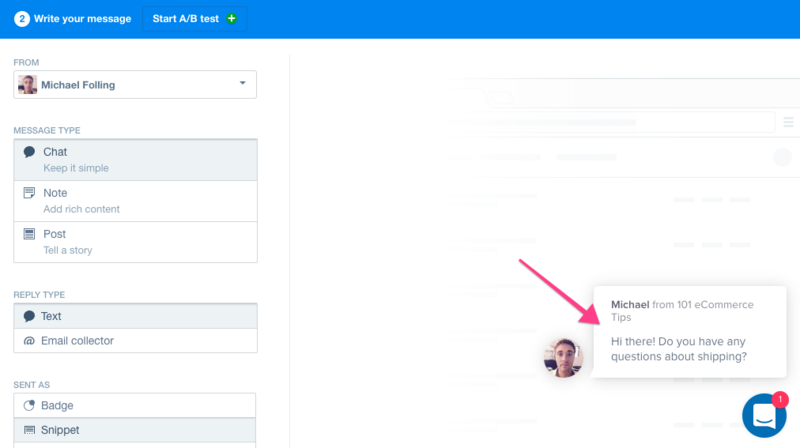 Fortunately, Intercom makes it easy for you to do this. Chat messages are a great way to engage your website visitors to increase your conversion rate or just get their email address so that you can market to them in the future. You can think of a chat message the same way as greeting people when they walk into your brick-and-mortar store. It’s their first impression of you and your brand, so the quality of your greeting can be the difference whether they make a purchase or not. If your proactive message isn’t warm or engaging enough, the visitor may not reply and you may lose a chance to convert them into a customer. Did you know that 80% of people who read a headline copy won’t read the rest of the blog post? This is why it’s so important to write great blog post titles. But how do you know what’s considered a good title? Well, you can split-test your blog post titles to find out. With a WordPress plug-in called Title Experiments, it’s easy to create 2 versions of titles for each of your blog posts. So far, I’ve shown you how to run A/B tests within third-party tools, but what about doing actual A/B tests on your website itself? Increasing conversions by changing your website’s copy, colors, and layout are where the fun begins when it comes to A/B testing. The great thing about A/B testing with VWO is that you don’t have to be technical so that you can do it yourself without the need to hire a developer. 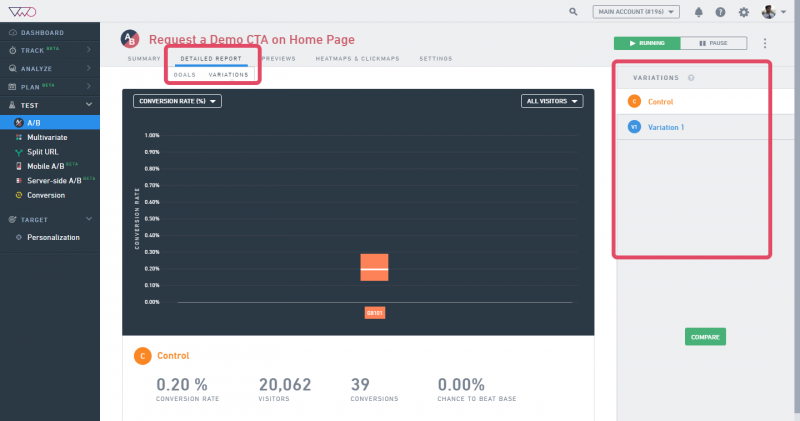 From your VWO dashboard, you can view the results of the A/B test. You can see which variation resulted in more conversions and whether the data is statistically significant so that you can be confident of the results. Just like the other tools mentioned above, VWO tells you when you’ve collected enough data to make a statistically significant decision about the results. A/B testing isn’t as hard as it seems. 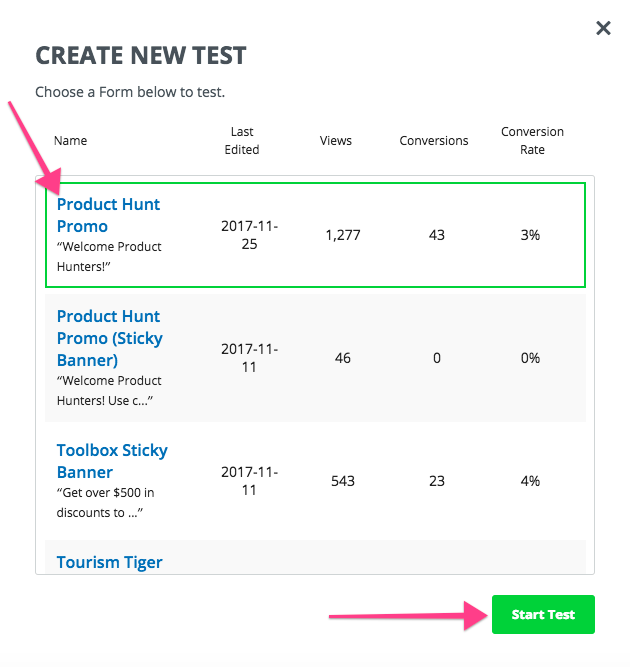 It’s pretty easy to give A/B testing a try, thanks to the built-in features found in marketing software these days. So if you’re ready to take the leap and want to run your first split test campaign, give one of the above-mentioned tools a try. I think you’ll find that it’s easier than you expected! Have you ran A/B tests by using the tools I just shared? Are there other tools with built-in A/B testing features that you think we can talk about? It would be awesome to hear from you in the comments! The post 6 Easy Ways To Learn A/B Testing (Number 6 Is Our Favorite) appeared first on Blog.